Patch on left contributed by Bob Shouse, others by Mike Smolinski. 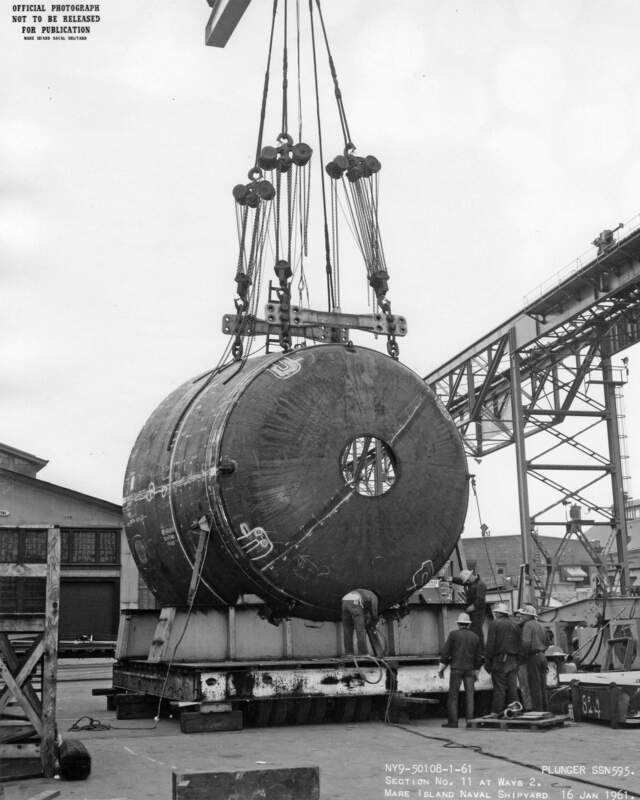 Thresher Class Attack Submarine: Laid down, 2 March 1960, at Mare Island Naval Shipyard, Vallejo, CA. 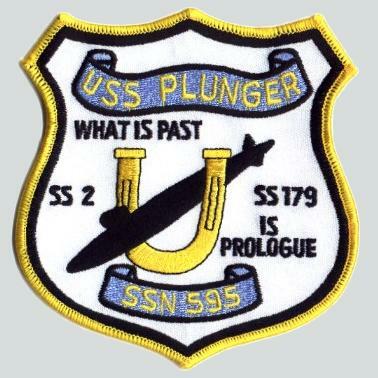 ; Launched, 9 December 1961; Commissioned, USS Plunger (SSN-595), 21 November 1962; Decommissioned, 3 January 1990; Struck from the Naval Register, 2 February 1990; Laid up at Bremerton Naval Shipyard; Final Disposition, entered the NPSSRP (Nuclear Powered Ship and Submarine Recycling Program) at Puget Sound Naval Shipyard, Bremerton, WA., 5 January 1995 and completed 8 March 1996. Specifications: Displacement, Surfaced: 3,540 t., Submerged: 4,200 t.; Length 278' 5"; Beam 31' 8"; ; Speed, Surfaced 15 kts, Submerged 28+ kts; Operating Depth 400'; Complement, 143; Sensors, Raytheon BQS-6A or -6B active/passive systems BQQ-1 and the Edo BQR-7 passive, conformal array, TB-26 Towed Sonar Array; Armament, four 21" torpedo tubes, forward, MK 48 torpedoes, UUM-44A SUBROC, UGM-84A/C Harpoon, MK 57 deep water mines, Mk 60 CAPTOR mines; Propulsion System, one S5W nuclear reactor, two Westinghouse steam turbines, one propeller 15,000 shp. 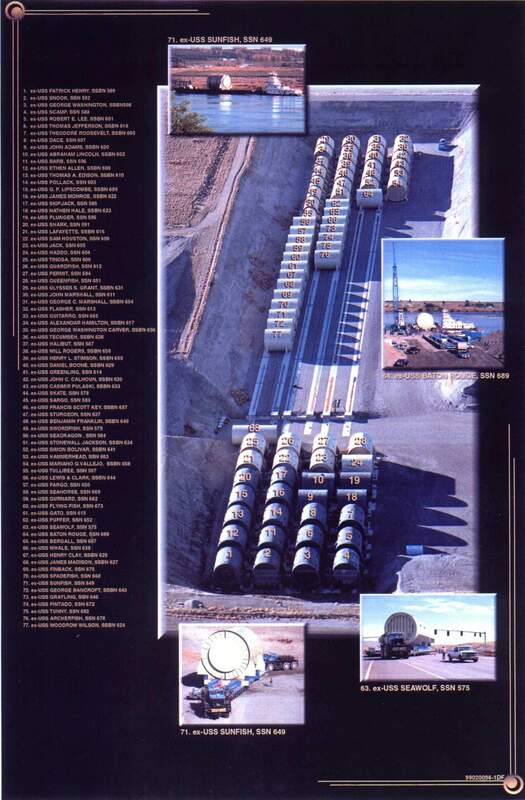 791k This picture appeared in the commissioning program of the Plunger (SSN-595). 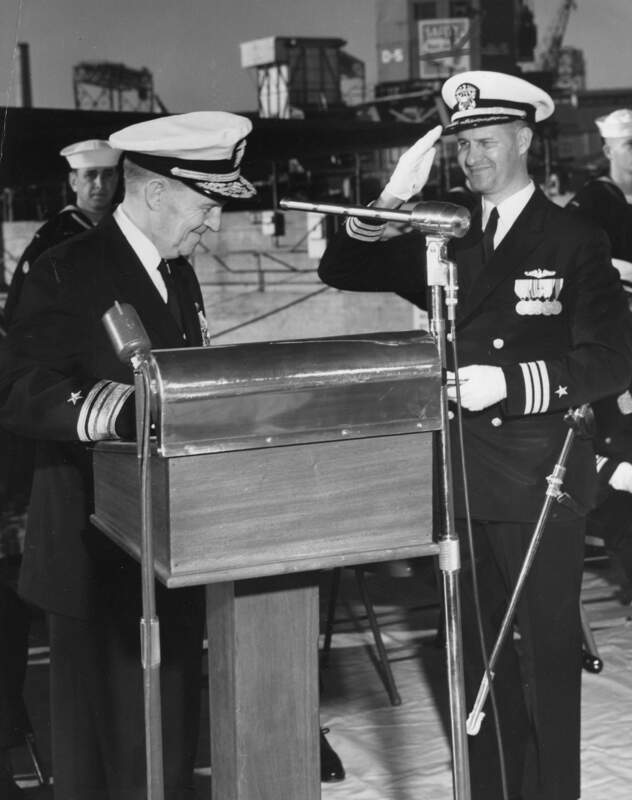 The photo's caption reads; "Shipyard Commander RADM L. V. Honsinger (right) officially lays Plunger's keel as previous Plunger (SS-179) Commanding Officer's Fleet Admiral Chester W. Nimitz (center) and RADM G. L. Russell (left, Commandant, 12th Naval District) look on. 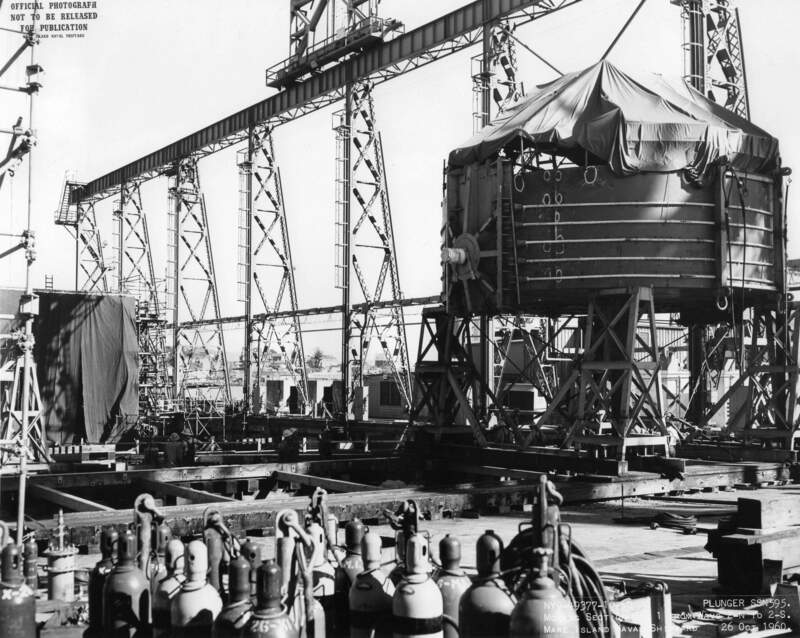 Plunger was the 500th ship constructed at the shipyard. USN photo # 47250-3-60 courtesy of the Vallejo Naval and Historical Museum via Darryl L. Baker. 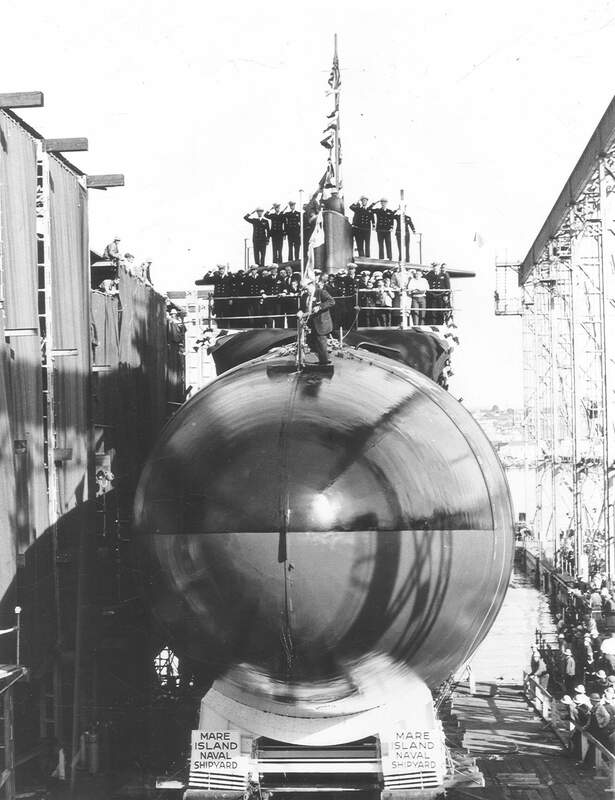 201k This photo shows the christening of the Scamp (SSN-588) at Mare Island Naval Shipyard on 8 October 1960. 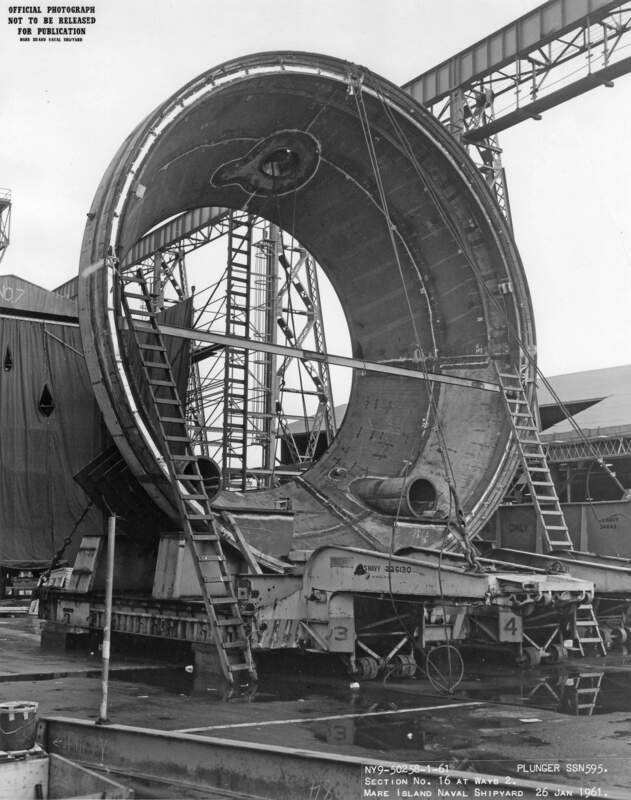 The first hull section of Plunger (SSN-595) can be seen on the building ways to the left on the Scamp. USN photo # MSA 49204-10-60, contributed by Darryl L. Baker. 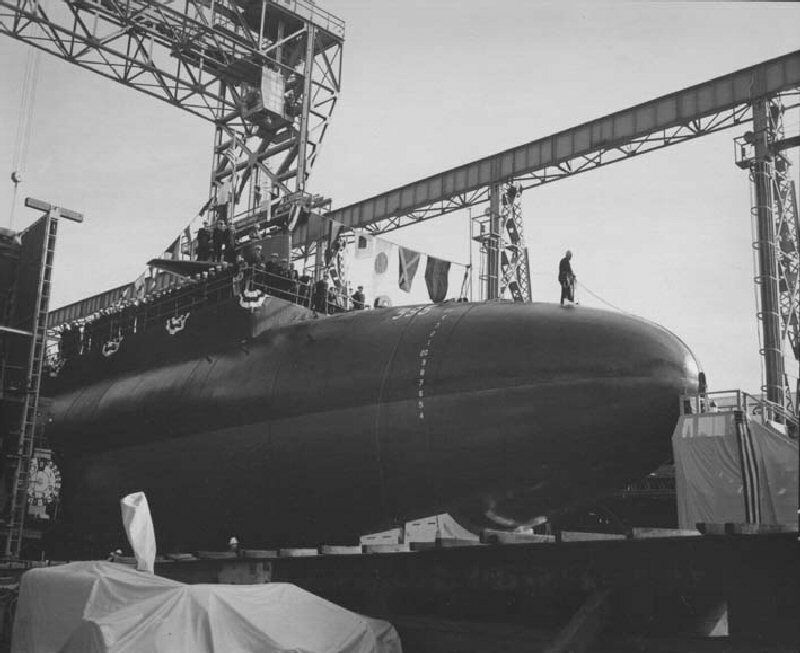 300k Starboard side view of Scamp (SSN-588) ready for launching with speaker at the microphone at Mare Island on 8 October 1960. 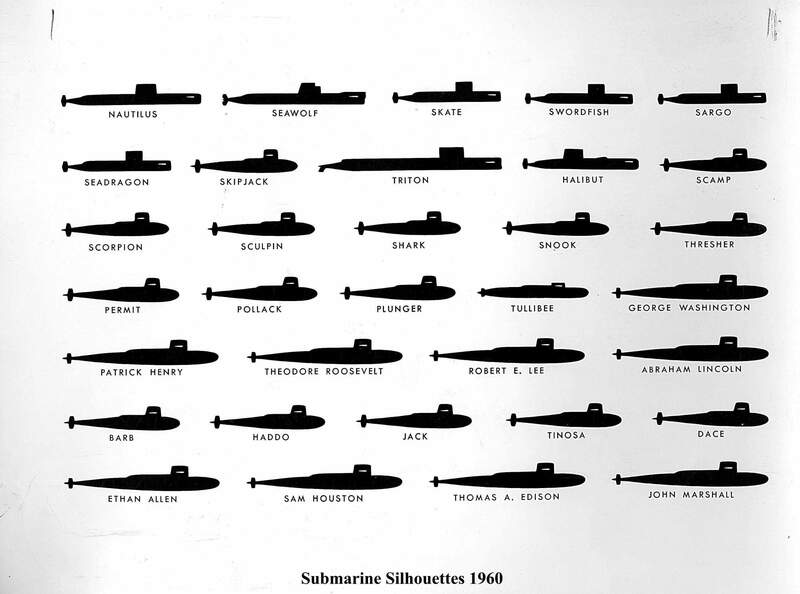 Keel of the Plunger (SSN-595) is to the left. USN photo # NY9 49179-10-60, contributed by Darryl L. Baker. 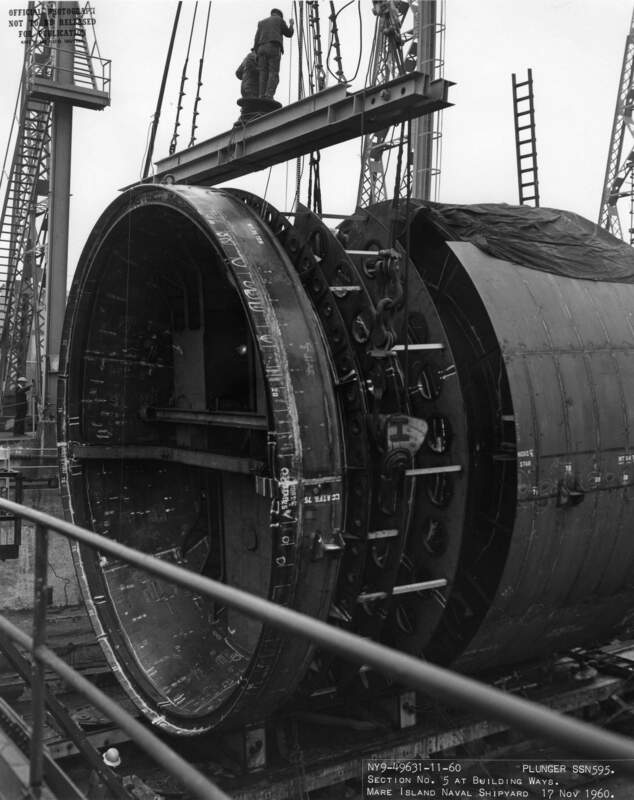 913k Section # 2 for Plunger (SSN-595) is shown being placed on the ways by YD-33 at Mare Island on 17 October 1960. USN photo # 49239-10-60, contributed by Darryl L. Baker. 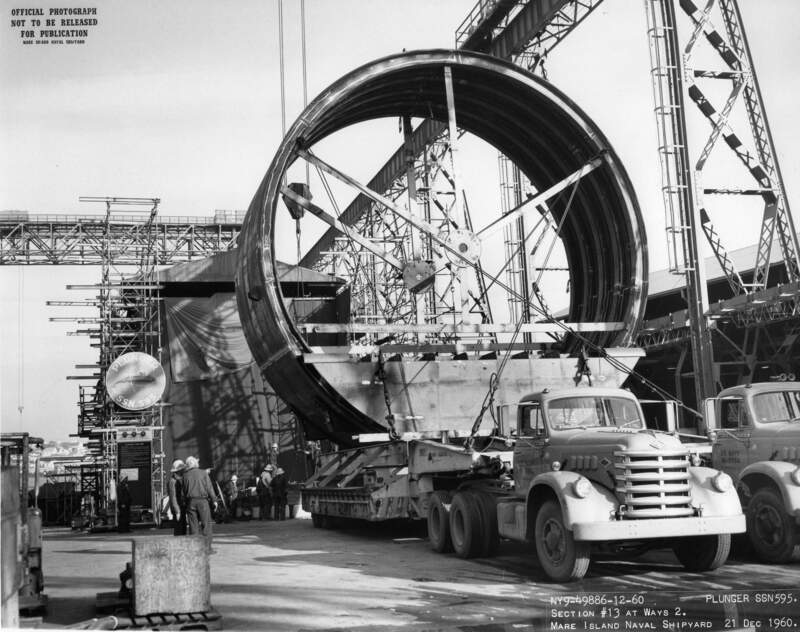 810k Section # 3 for Plunger (SSN-595) is shown being placed on the ways by YD-33 at Mare Island on 20 October 1960. USN photo # 49316-10-60, contributed by Darryl L. Baker. 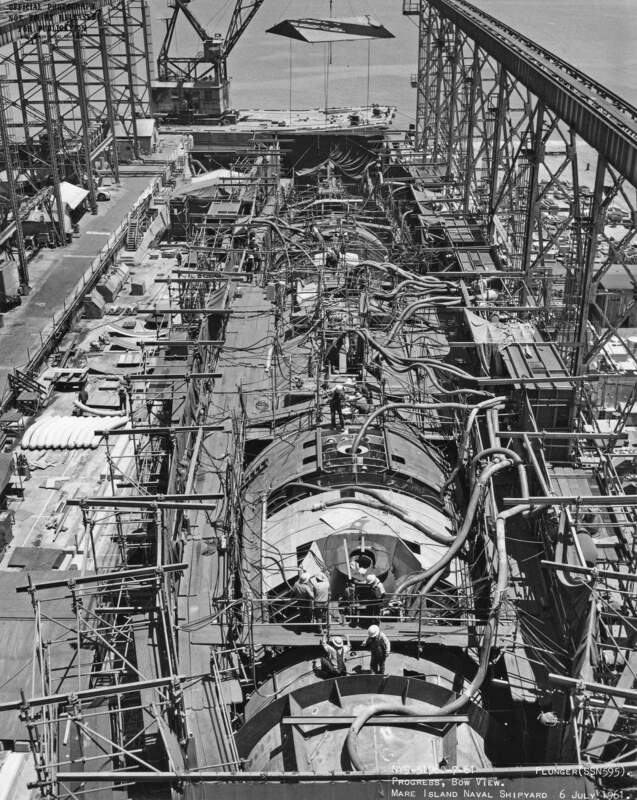 1.30k Sections #2 and #3 for Plunger (SSN-595) are shown mated together on the ways at Mare Island on 20 October 1960. USN photo # 49316-10-60, contributed by Darryl L. Baker. 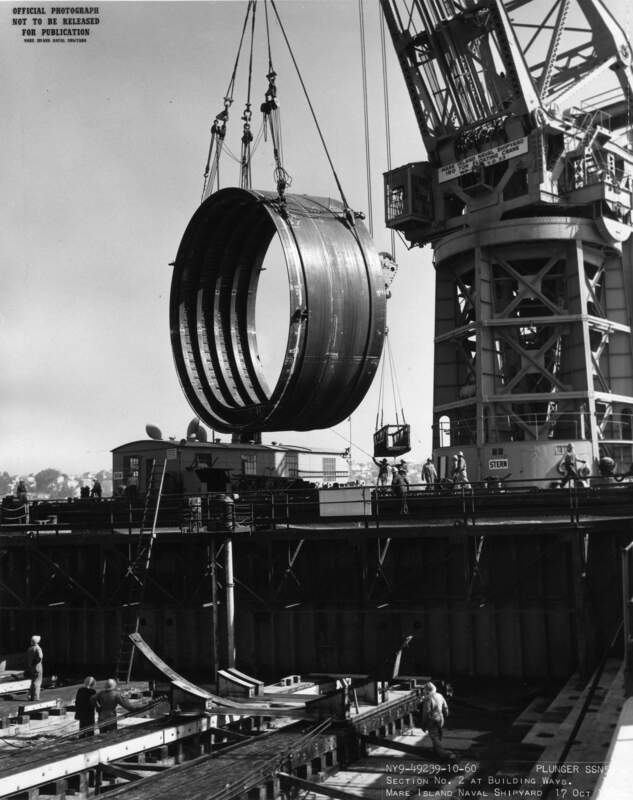 170k Section #3 (aft bulkhead section) of the Plunger (SSN-595) is lifted onto the building ways on 20 October 1960 at Mare Island Naval Shipyard. 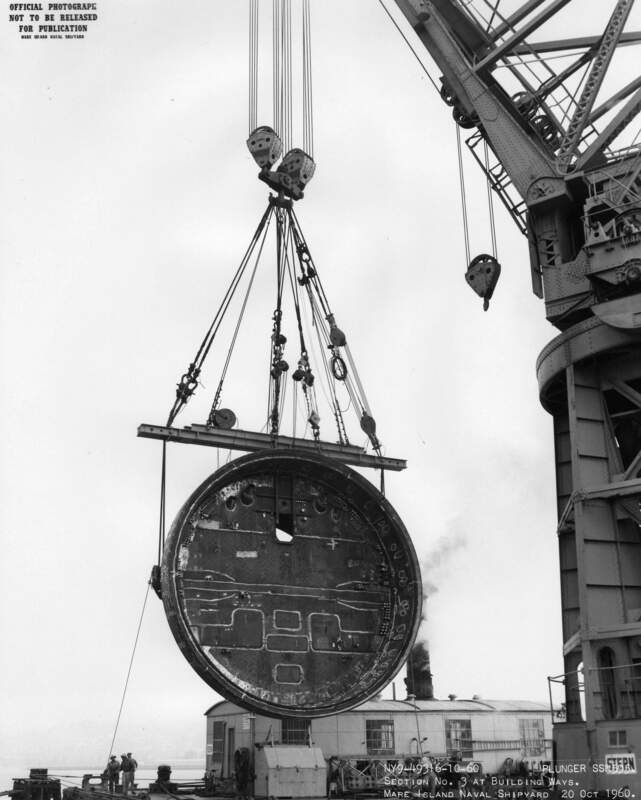 The after sections of the ship were transported to the ways and put in place by the shipyard's 150 ton floating crane. USN photo # NY9-49317-10-60, courtesy of Darryl L. Baker. 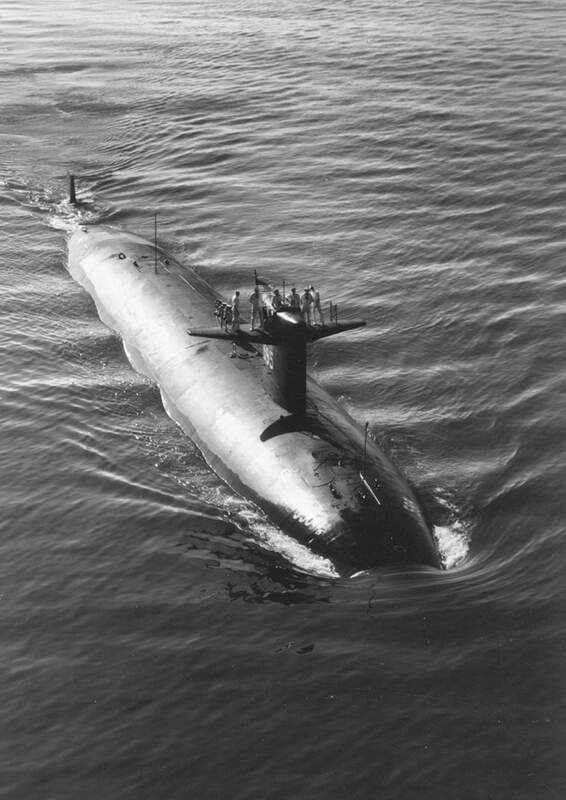 1.20k Section # 1 for Plunger (SSN-595) is shown on the ways by at Mare Island on 26 October 1960. USN photo # 49377-10-60, contributed by Darryl L. Baker. 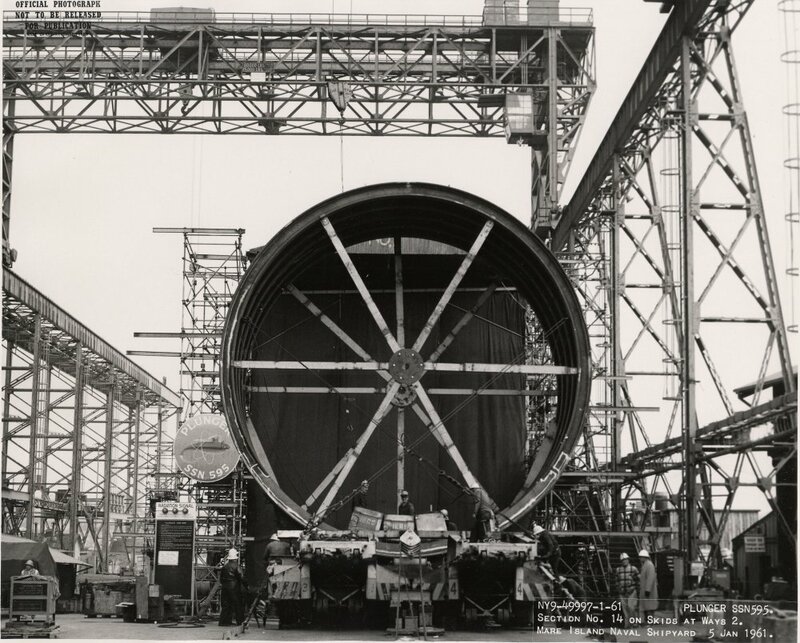 1.00k Section # 4 for Plunger (SSN-595) is shown on the ways by at Mare Island on 15 November 1960. USN photo # 49629-11-60, contributed by Darryl L. Baker. 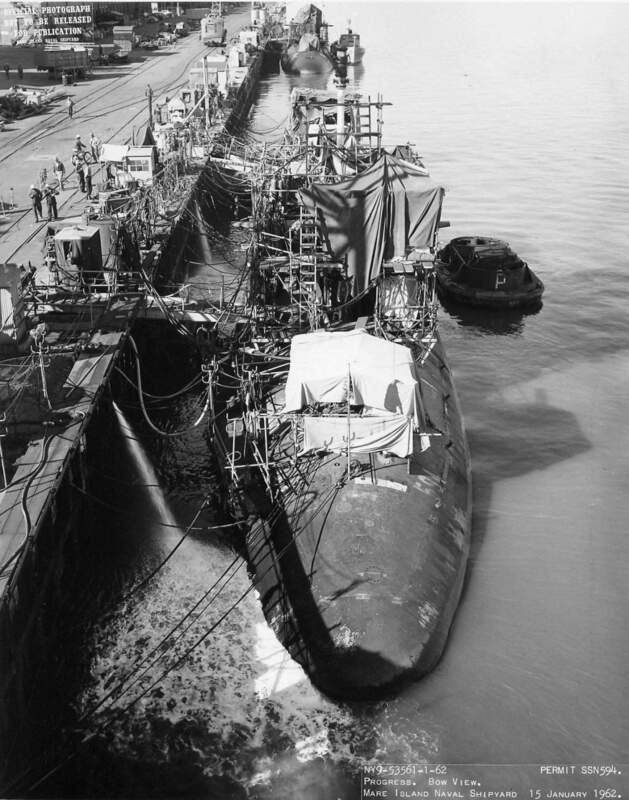 856k Sections # 4 and # 5 for Plunger (SSN-595) are shown mated together on the ways at Mare Island on 17 November 1960. USN photo # 49631-11-60, contributed by Darryl L. Baker. 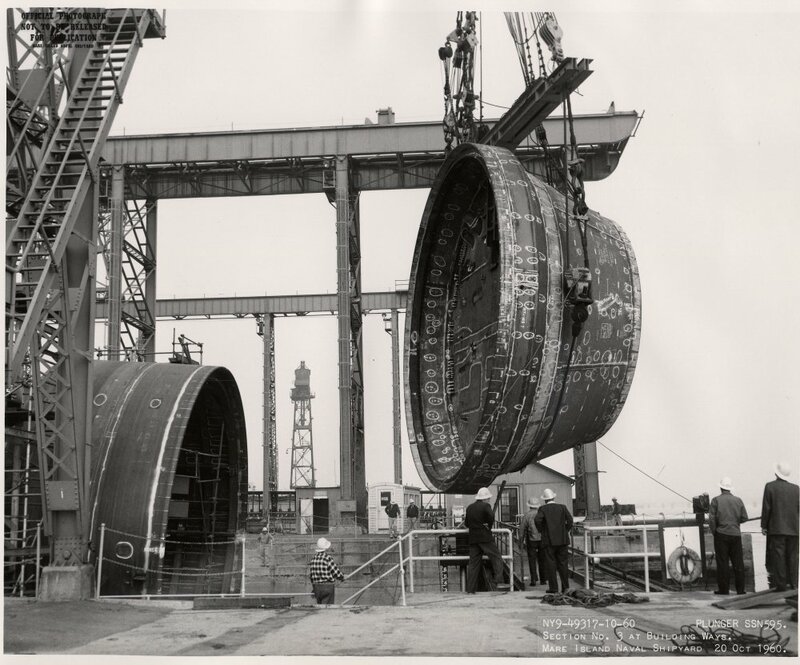 778k Sections # 6, # 7 & # 8 for Plunger (SSN-595) are shown being placed on the ways at Mare Island on 12 December 1960. USN photo # 49865-12-60, contributed by Darryl L. Baker. 1.10k Sections # 13 for Plunger (SSN-595) is shown arriving at the ways at Mare Island on 21 December 1960. USN photo # 49886-12-60, contributed by Darryl L. Baker. 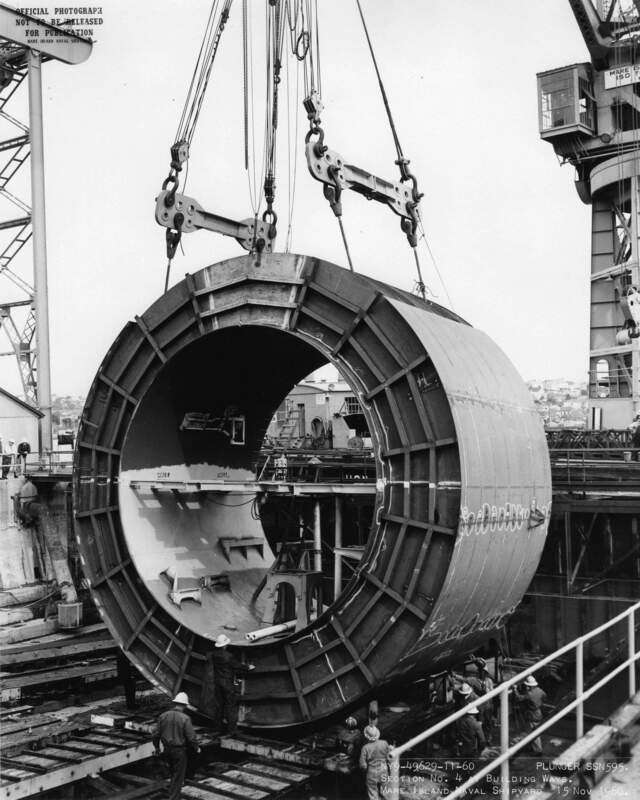 1.00k Sections # 10 for Plunger (SSN-595) is shown being placed on the ways at Mare Island on 29 December 1960. USN photo # 49935-12-60, contributed by Darryl L. Baker. 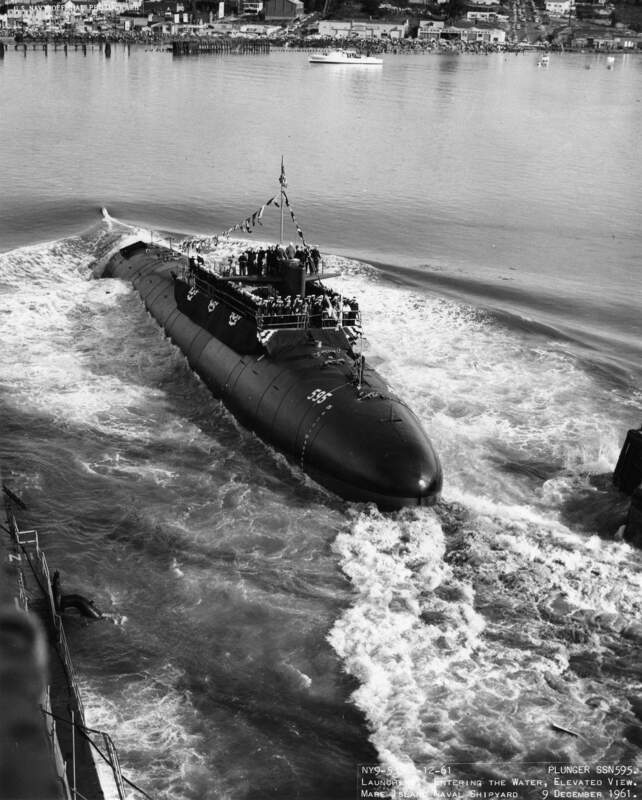 1.20k Section # 14 for Plunger (SSN-595) arriving at the ways at Mare Island on 4 January 1961. USN photo # 49995-1-61, contributed by Darryl L. Baker. 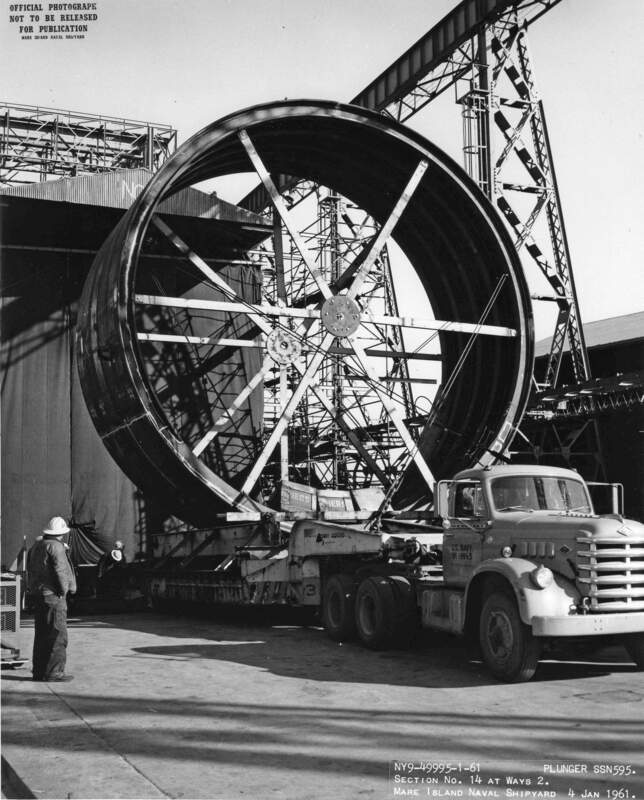 206k Section # 14 of the Plunger (SSN-595) is shown on trailer used to transport the section from the southern hull fabrication area to the building ways on 5 January 1961 at Mare Island Naval Shipyard. USN photo # NY9-49997-1-61, courtesy of Darryl L. Baker. 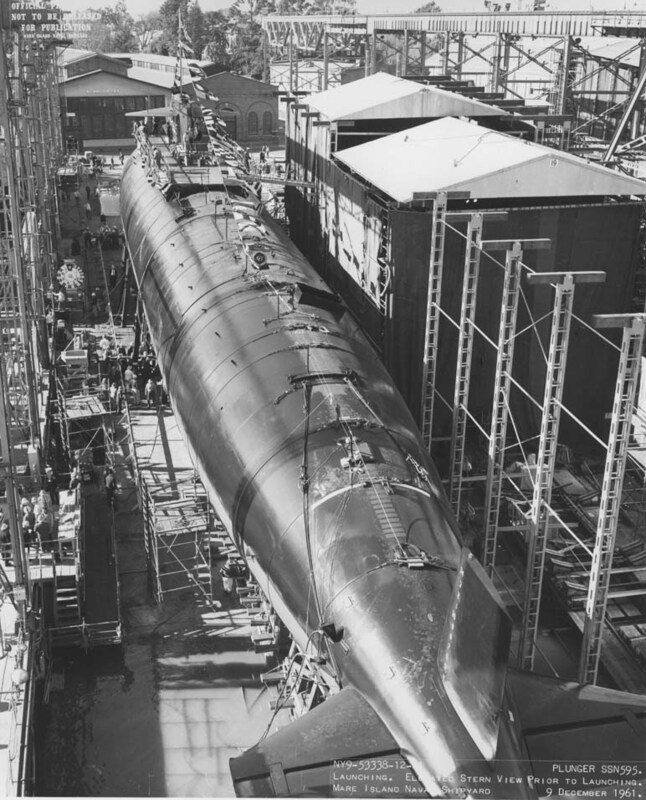 973k Section # 11 for Plunger (SSN-595) is shown being ready for placement on the ways at Mare Island on 16 January 1961. USN photo # 50108-1-61, contributed by Darryl L. Baker. 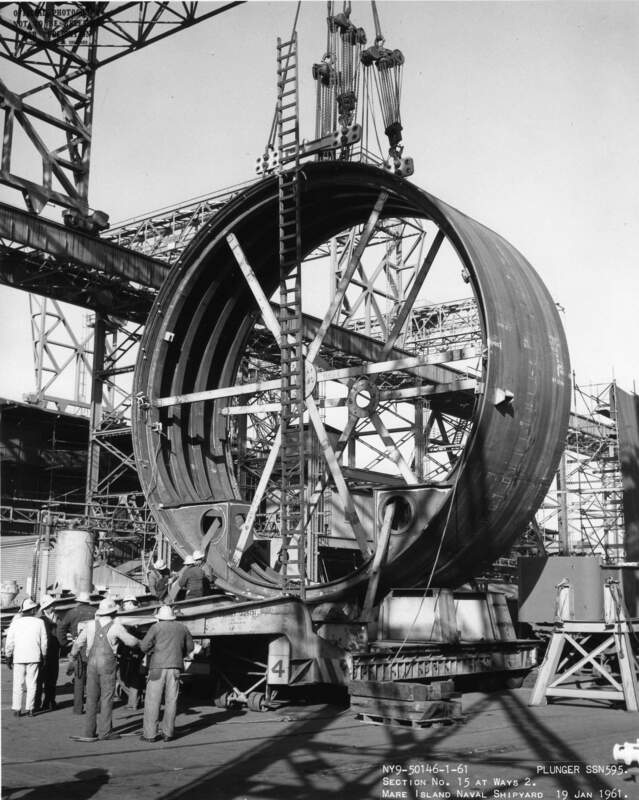 1.20k Section # 15 for Plunger (SSN-595) is shown being placed on the ways at Mare Island on Mare Island on 19 January 1961. USN photo # 50146-1-61, contributed by Darryl L. Baker. 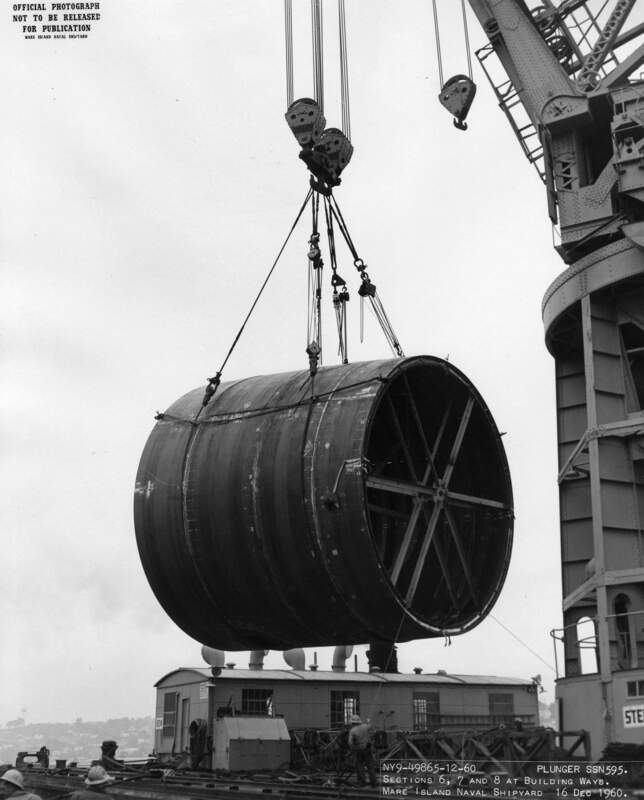 1.10k Section # 16 for Plunger (SSN-595) is shown being placed on the ways at Mare Island on Mare Island on 26 January 1961. USN photo # 50258-1-61, contributed by Darryl L. Baker. 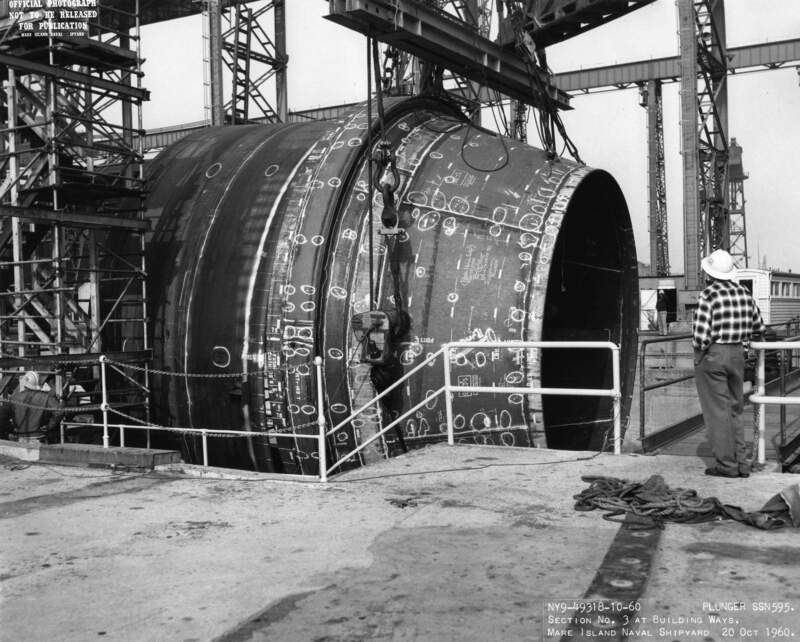 1.50k Progress view looking toward the stern of Plunger (SSN-595) on the ways at Mare Island on 6 July 1961. YD-172 is in the background still in her old US Army BD-6068 paint job. USN photo # NY9-51960-7-61, courtesy of Darryl L. Baker. 1.50k Progress view looking toward the bow of Plunger (SSN-595) on the ways at Mare Island on 6 July 1961. USN photo # NY9-51961-7-61, courtesy of Darryl L. Baker. 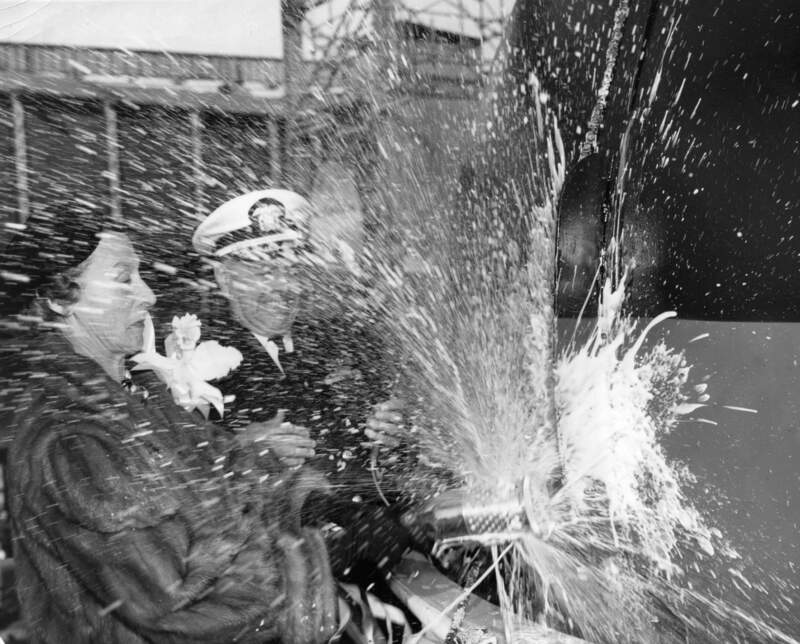 1.10k Mrs. Clinton P. Anderson christens the Plunger (SSN-595) at Mare Island on 9 December 1961. Capt P. F. Straub is in the background. USN photo # 53356-12-61 courtesy of the Vallejo Naval and Historical Museum via Darryl L. Baker. 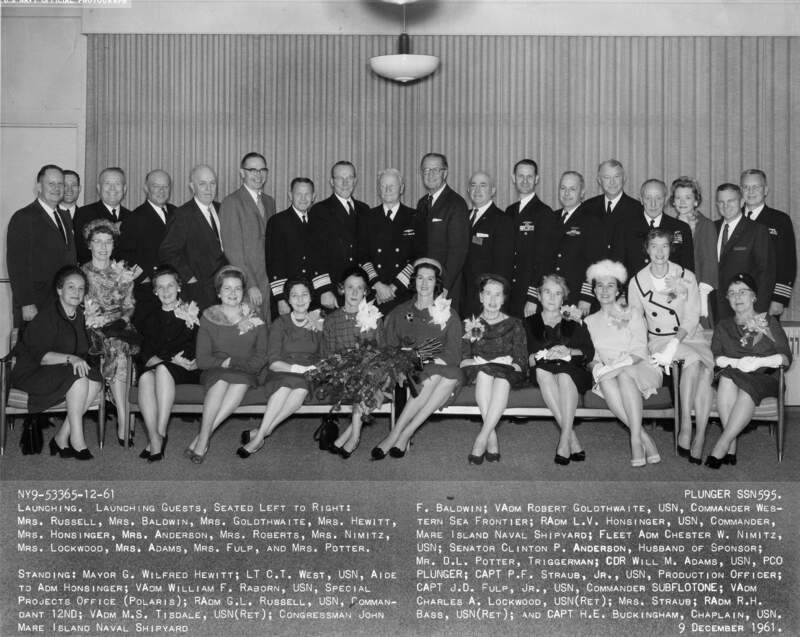 801k CDR Will M. Adams Jr. (CO) and LCDR A. J. M. Atkins (XO) pictured with Californians of the crew of the Plunger (SSN-595) at Mare Island on 8 December 1961. Left to Right: 1st row CDR Will M. Adams Jr. (CO) & LCDR A. J. M. Atkins (XO); 2nd row, LT R. L. Kelsey (Navigator) & LT William A. Lynch (Ops); 3rd row, MM2 Harold L. Bartke (Concord); YN3 Floyd Fry (Oroville); EM2 Robert E. Lawrence (Vallejo); ETC Robert J. Caylor (Colma); ET2 Robert V. Cavin (San Mateo,); YN2 Kenneth W. Genn (Turlock); EMC Stuart E. Shipman (Chico) & EMC Fred M. Caballero (Sacramento). USN photo courtesy of the Vallejo Naval and Historical Museum via Darryl L. Baker. 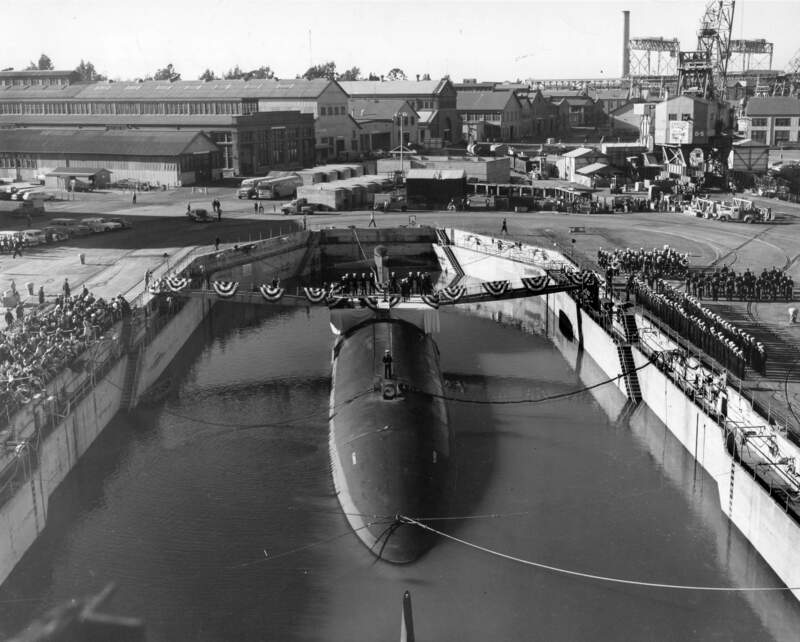 76k The crew of the Plunger (SSN-595) stand at attention around the boat's sail on the building ways at Mare Island Naval Shipyard just prior to launching on 9 December 1961. USN photo # NY9-53381-12-61 courtesy of Tracy White @ Researcher @ Large. 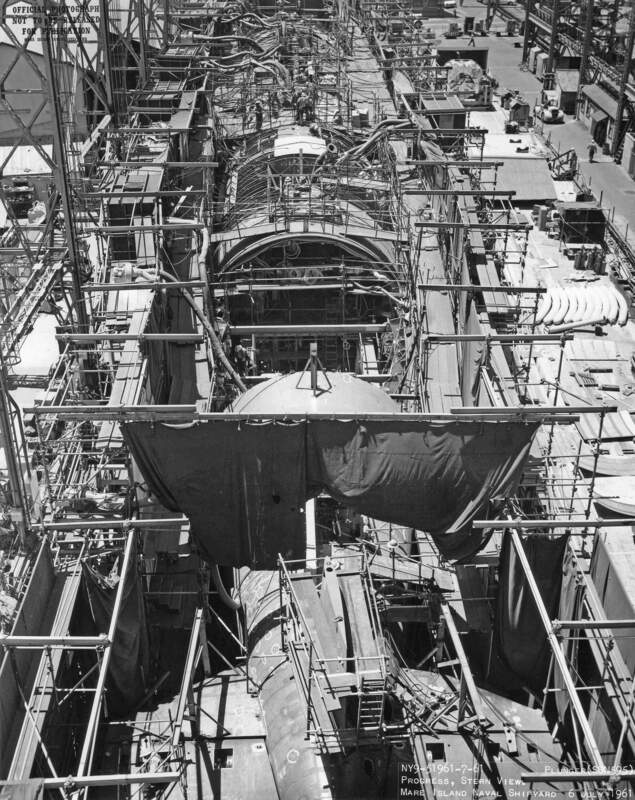 795k The Plunger (SSN-595) & general scene on the building ways at Mare Island Naval Shipyard just prior to launching on 9 December 1961. 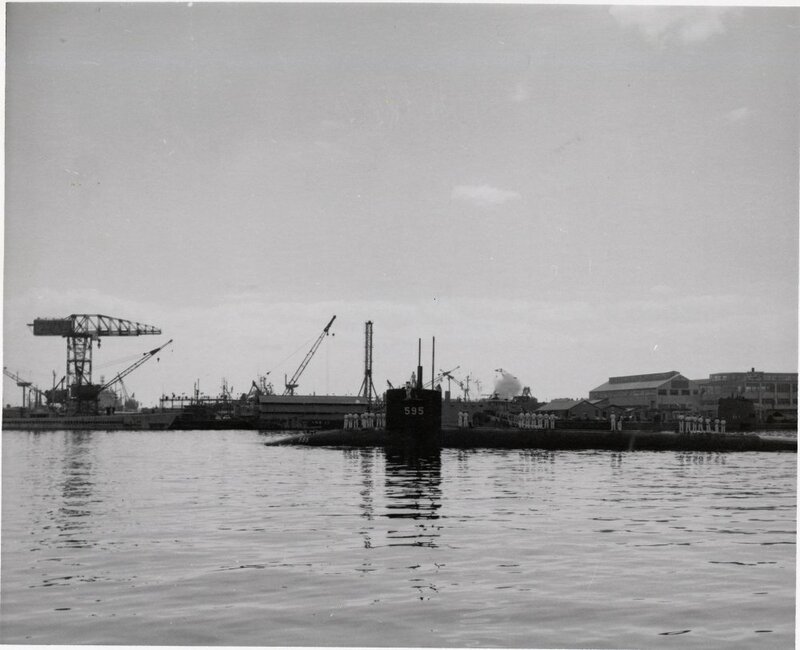 The Woodrow Wilson (SSBN-624) is under constructionon the ways to the left. Photo courtesy of Dale Hargrave. 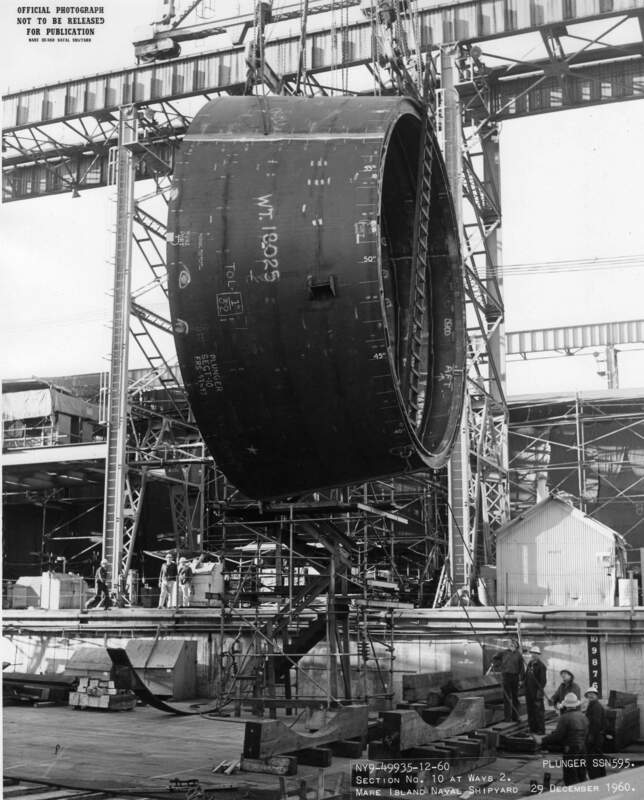 141k Elevated stern view of the Plunger (SSN-595) on the building ways at Mare Island Naval Shipyard just prior to launching on 9 December 1961. USN photo # NY9-53338-12-61 courtesy of Tracy White @ Researcher @ Large. 2.06k Plunger (SSN-595) about to start her slide seaward. USN photo courtesy of Scott Koen & ussnewyork.com. 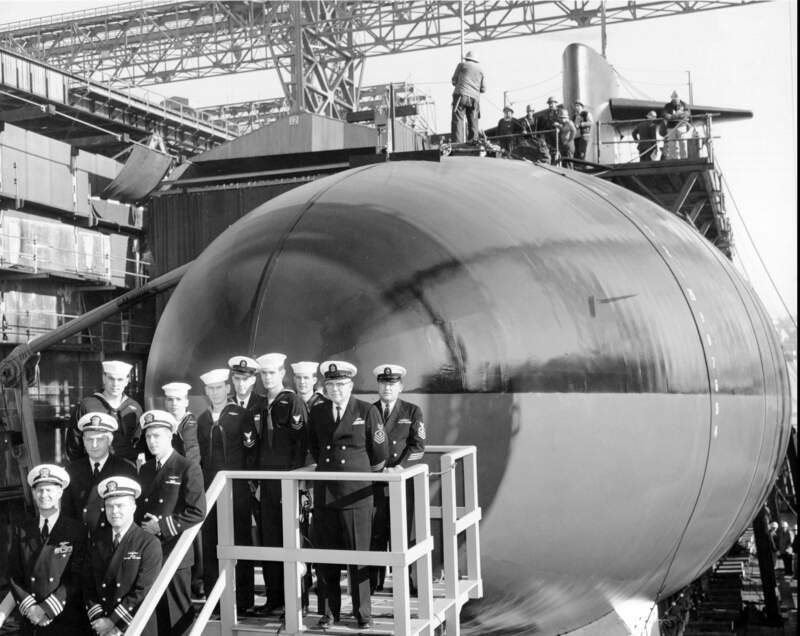 122k The officers & crew of the Plunger (SSN-595) stand at attention as the boat is waterborne on 9 December 1961. USN photo # NY9-533359-12-61 courtesy of Tracy White @ Researcher @ Large. 2.90k Plunger (SSN-595) at the end of the way at Mare Island Naval Shipyard, Vallejo, CA., 9 December 1961. USN photo # 53362-12-61, courtesy of the Vallejo Naval and Historical Museum. Photo contributed by Darryl L. Baker. 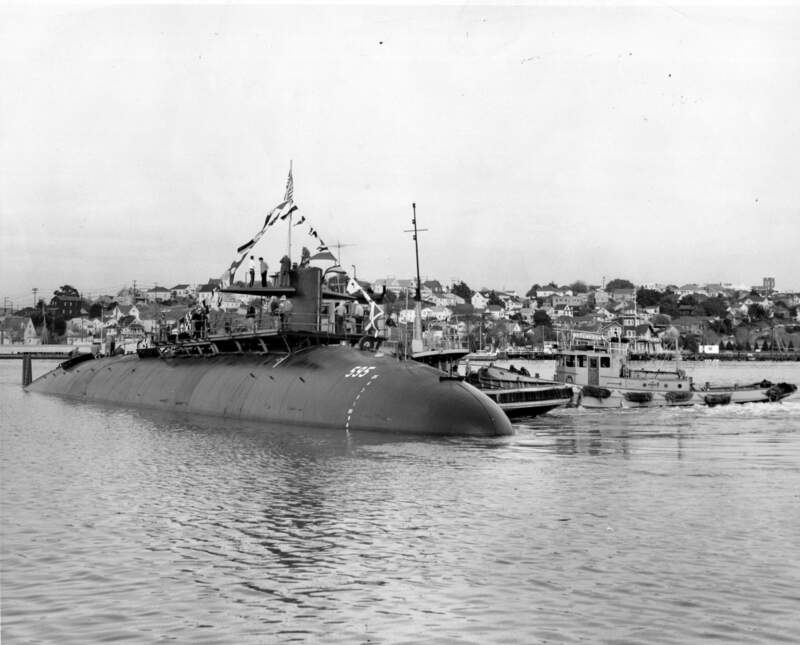 835k The Plunger (SSN-595) is in the middle of the Mare Island Channel after her launching at Mare Island. YTL 434 is in the background. USN photo # 53364-12-61 courtesy of the Vallejo Naval and Historical Museum via Darryl L. Baker. 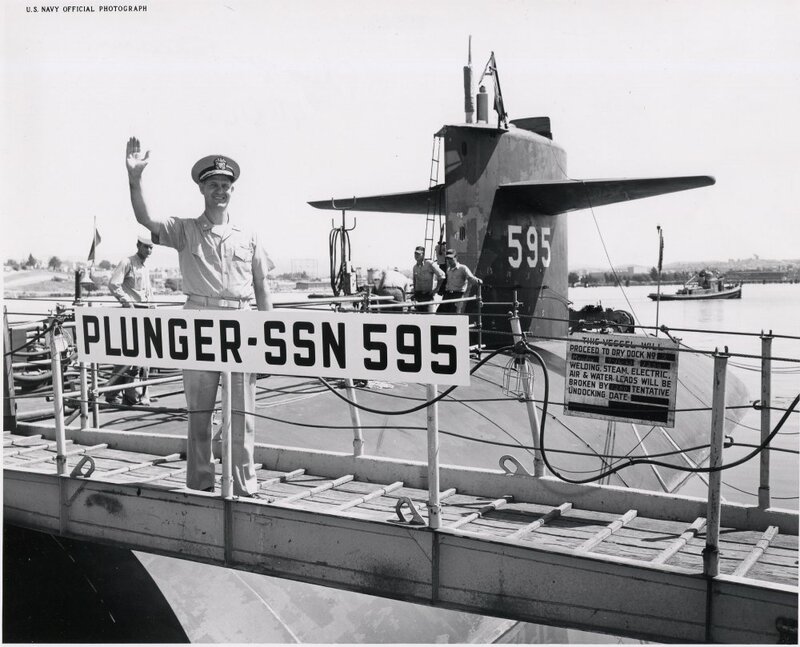 1.60k The official and VIPs for the launching of the Plunger (SSN-595) at Mare Island on 9 December 1961. USN photo # 53365-12-61, courtesy of the Vallejo Naval and Historical Museum. Photo contributed by Darryl L. Baker. 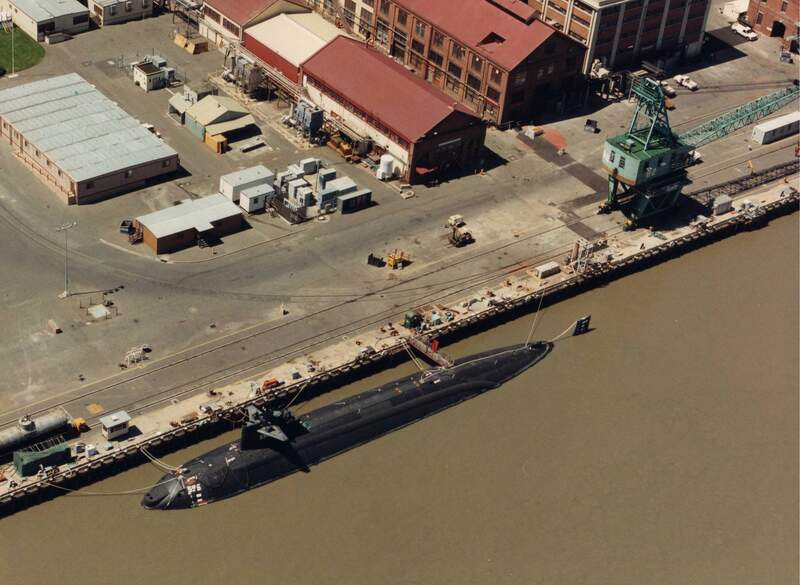 104k A thrashing Plunger (SSN-595) is tethered pierside at her outfitting berth at Mare Island. USN photo # NY9-533359-12-61 courtesy of Tracy White @ Researcher @ Large. 241k Forward plan view of Permit (SSN-594) at her outfitting berth at Mare Island on 15 January 1962. 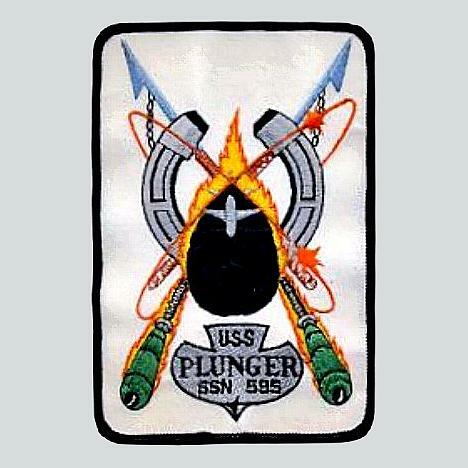 The Plunger (SSN-595) is aft of Permit. USN photo # 53561-1-62, contributed by Darryl L. Baker. 173k Plunger (SSN-595) at sea 9/1962 during her trials after construction at Mare Island Naval Shipyard. 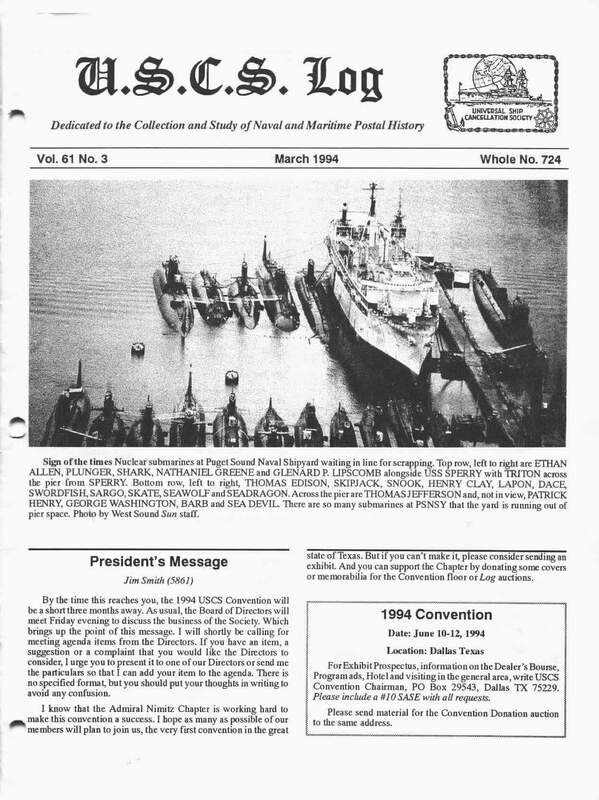 The Plunger is noted as the 500th ship built by the shipyard. Note: Area above sail was touched-up to erase the ship's masts. This photo was used on the cover on her commissioning program. USN photo # 56803, courtesy of Darryl L. Baker. 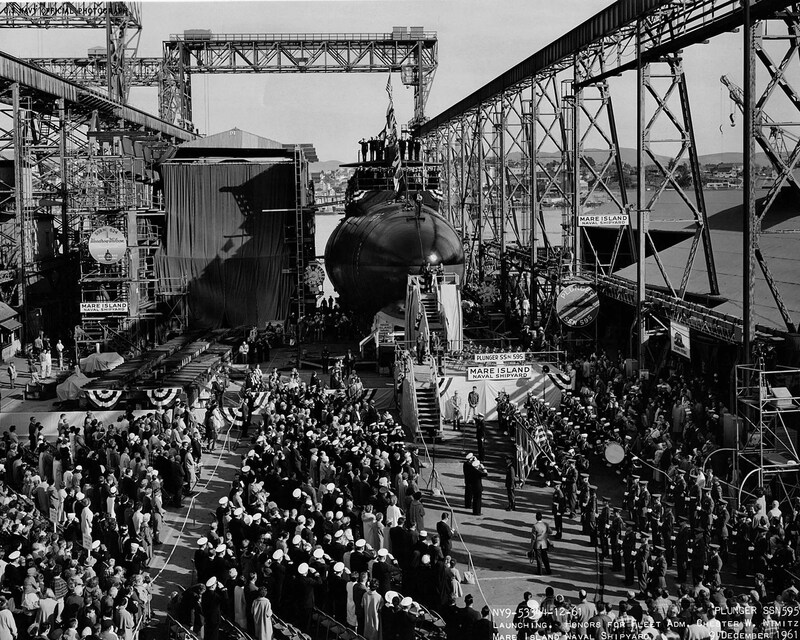 1.10k Commissioning ceremonies for the Plunger (SSN-595) in Mare Island's dry dock #3 on 21 November 1962. USN photo # 57040-11-62, courtesy of the Vallejo Naval and Historical Museum via Darryl L. Baker. 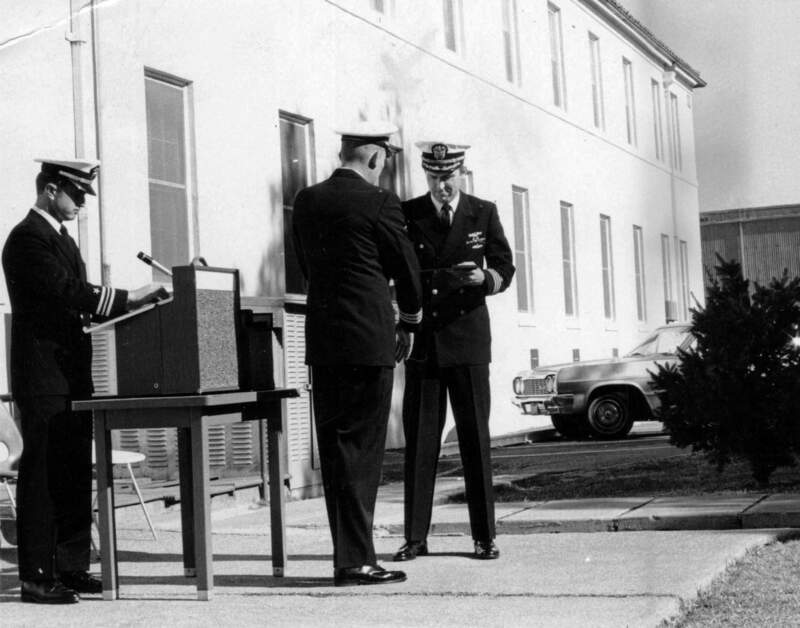 751k RADM E. E. Yeoman (Commandant 12th Naval District) presents the log book of the past three Plungers to CDR Will Adams (Commanding Officer) during commissioning ceremonies of Plunger (SSN-595) at Mare Island. USN photo # 57041-11-62, courtesy of the Vallejo Naval and Historical Museum via Darryl L. Baker. 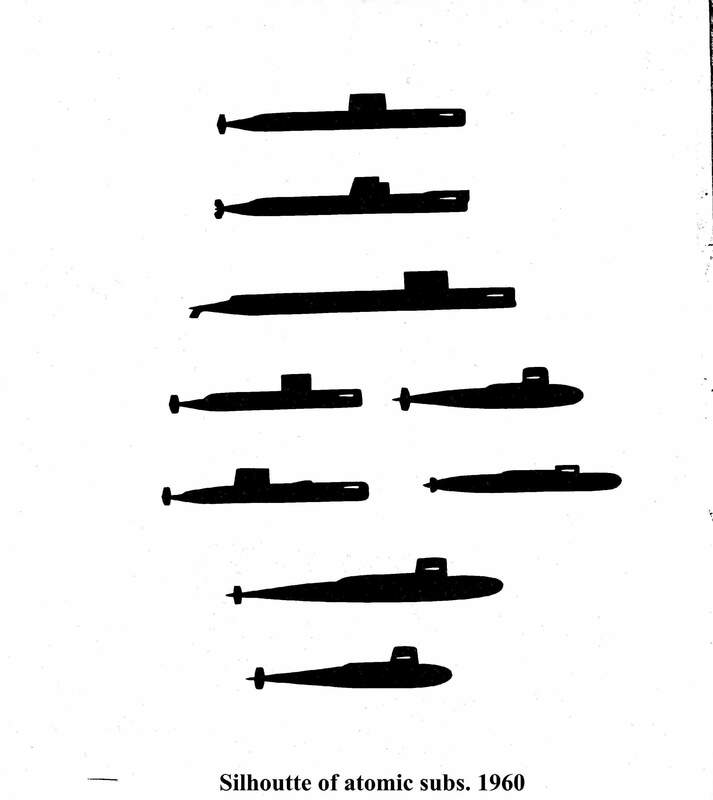 1.50k Six page PDF of the Plunger's (SSN-595) Commissioning Program, 21 November 1962. USN photo contributed by Darryl L. Baker. 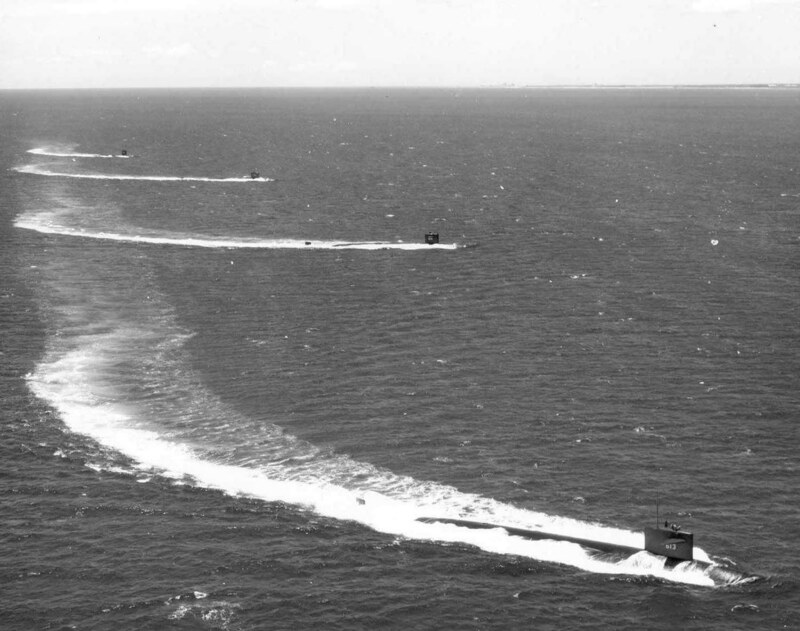 101k Plunger (SSN-595) glides past Pearl Harbor Naval Shipyard on 12 January 1963. 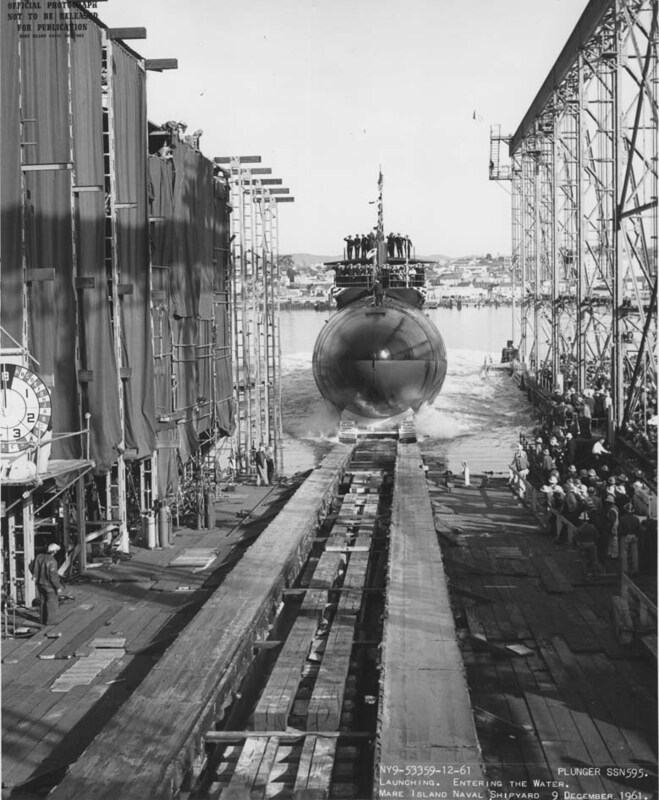 This was her first deployment after commissioning at Mare Island Naval Shipyard on 21 November 1962. USN photo courtesy of Darryl L. Baker. 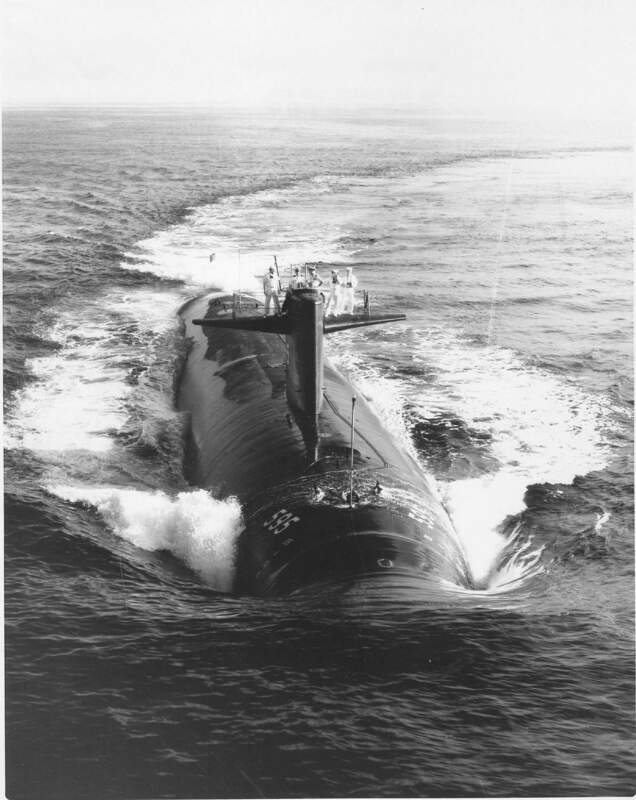 170k The Plunger (SSN-595), underway off the coast of Oahu Hawaii, during her shakedown cruise to Pearl Harbor 15 January 1963. USN offical photo # 1067832, by PHCS Carlisle, courtesy of David Buell. 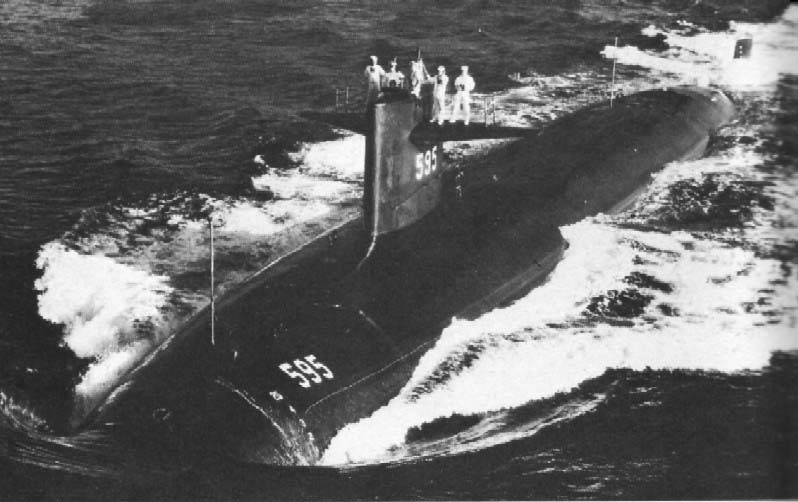 106k Plunger (SSN-595) off the coast of Hawaii during her first fleet deployment in 1963. USN photo courtesy of Robert Hurst. 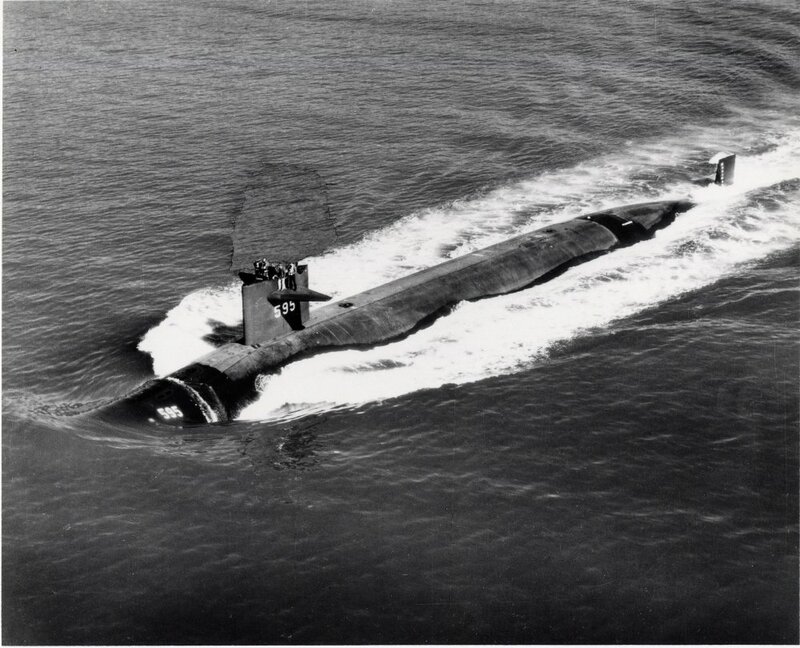 1.01k Plunger (SSN-595) off the coast of Hawaii during her first fleet deployment in 1963. USN photo courtesy of Scott Koen & ussnewyork.com. 147k CDR Will M Adams, USN, Commanding Officer of the Plunger (SSN-595) is seen crossing the brow on 13 Sep 1963. 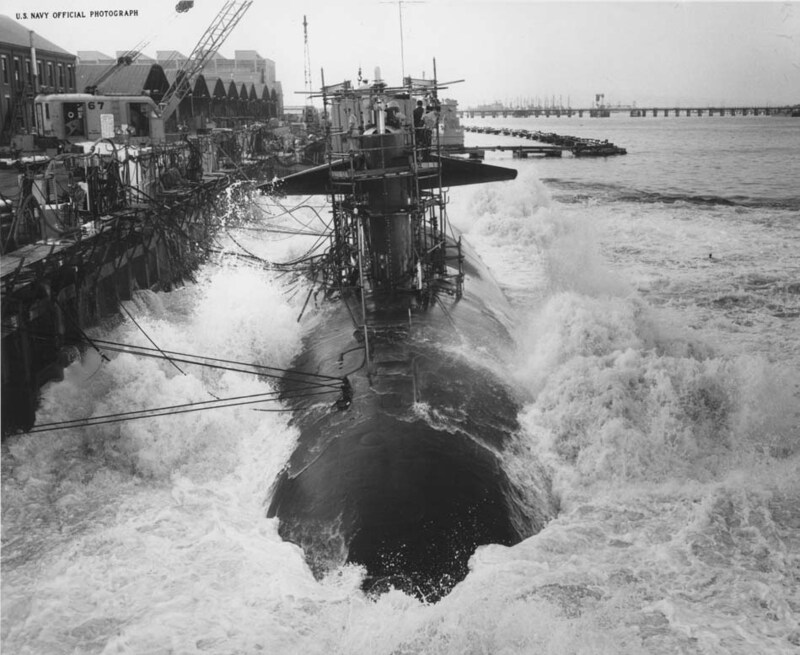 Plunger was at Mare Island from 13 September 1963 to 8 February 1964 for a restrictive availability. USN photo # 60503, courtesy of Darryl L. Baker. 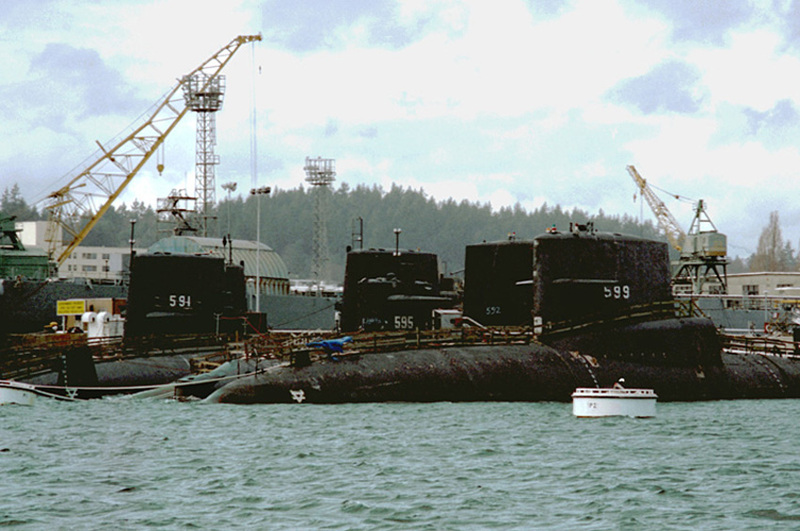 39k The Plunger (SSN-595), tied-up alongside the Scamp (SSN-588) with the Permit (SSN-594) behind, c1964, probably at Pearl Harbor. The submarine tender Sperry (AS-12) is tied-up on the other side of the jetty. USN photo courtesy of Robert Hurst. 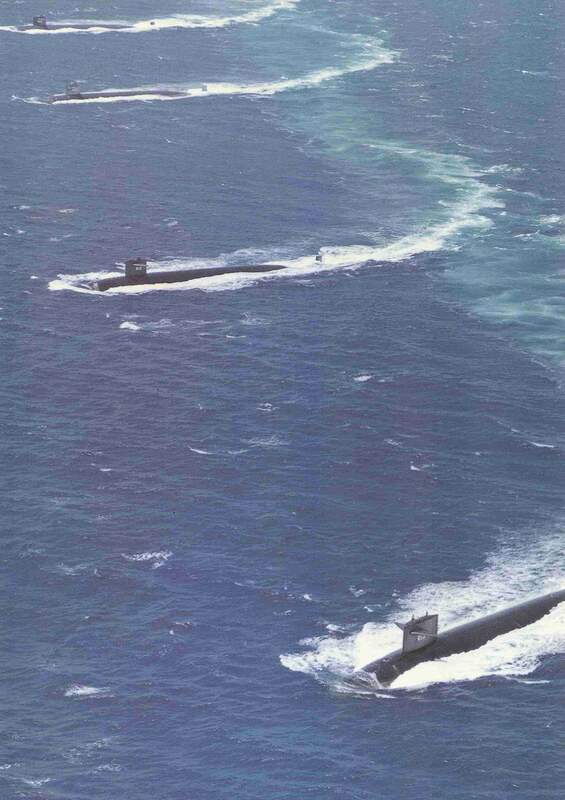 Plunger (SSN-595), Barb (SSN-596), Guardfish (SSN-612) & Flasher (SSN-613). USN photo courtesy of Scott Koen & ussnewyork.com. 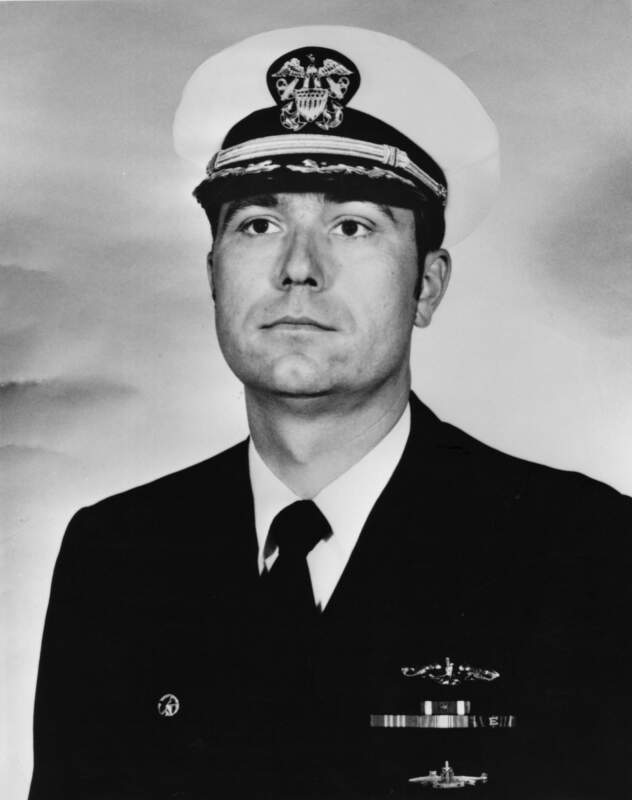 284k CDR A. L. Wilderman, Commanding Officer of Plunger (SSN-595), receives the Meritorious Unit Commendation award from CDR A. A. Young (SUBPAC representative at Mare Island) at Mare Island on 1 December 1971. USN photo courtesy of the Vallejo Naval and Historical Museum via Darryl L. Baker. 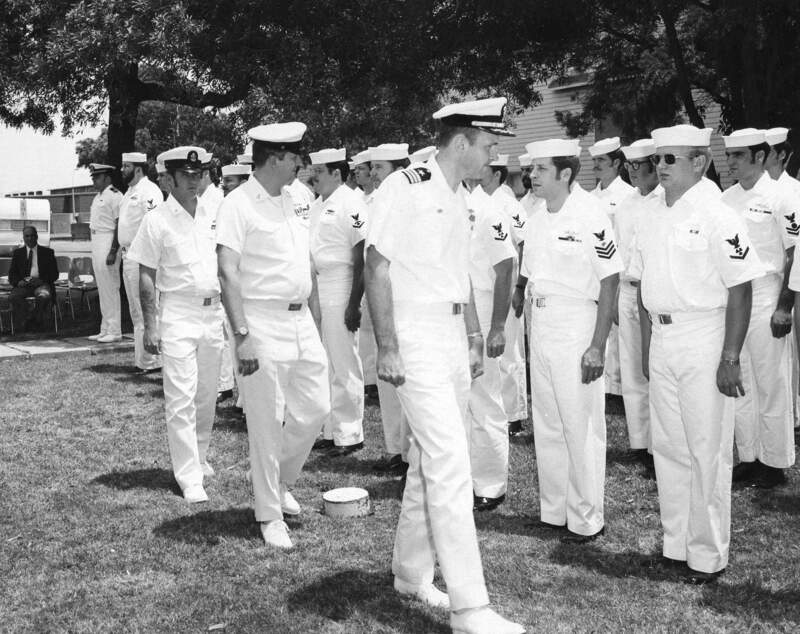 1.50k Retirement ceremonies for QMC Merle Vaughn (left) and MMCS Eugene Hayes (Center) following CDR A. L. Wilderman, commanding officer Plunger (SSN-595) at Mare Island in July 1973. USN photo courtesy of the Valllejo Naval and Historical Museum via Darryl L. Baker. 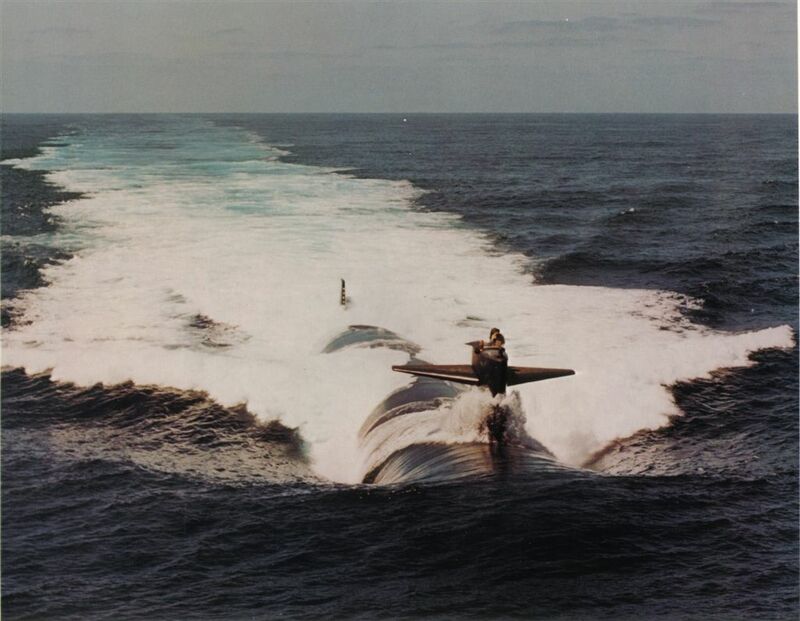 40k Bow on view of the Plunger (SSN-595) underway, probably off the coast of Hawaii, 1973. USN photo courtesy of tripod.com. 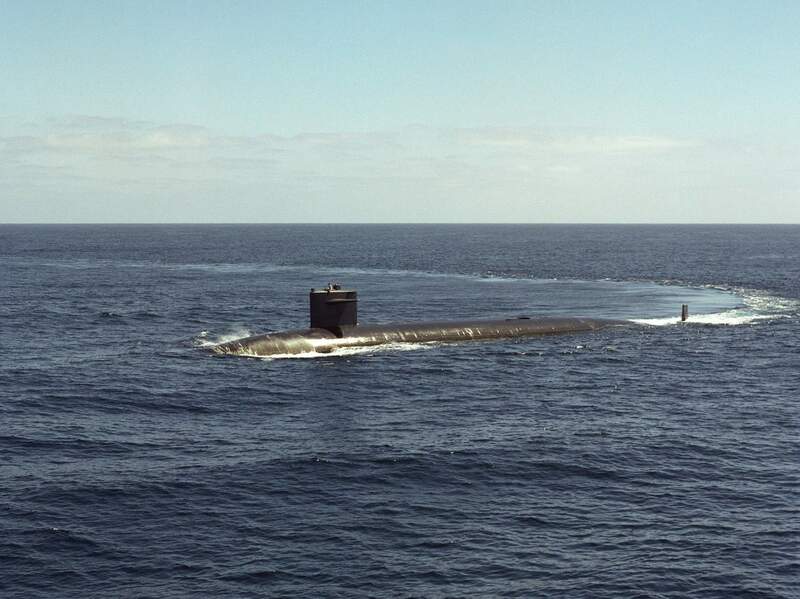 510k A starboard bow view of the nuclear-powered attack submarine Plunger (SSN-595) underway off the Southern California coast, 2 April 1976. 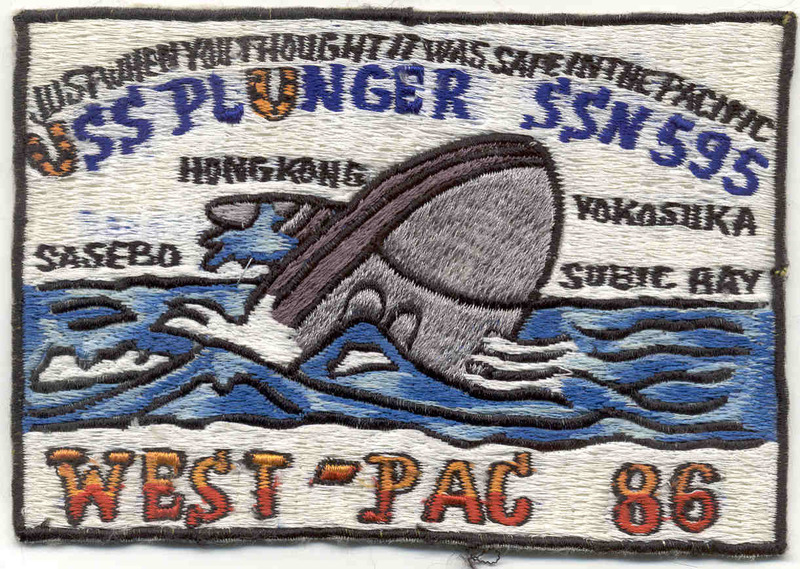 USN photo # DN-SC-85-06050, by PHCS R. L. Lawson, from the Department of Defense Still Media Collection, courtesy of Robert Hurst. 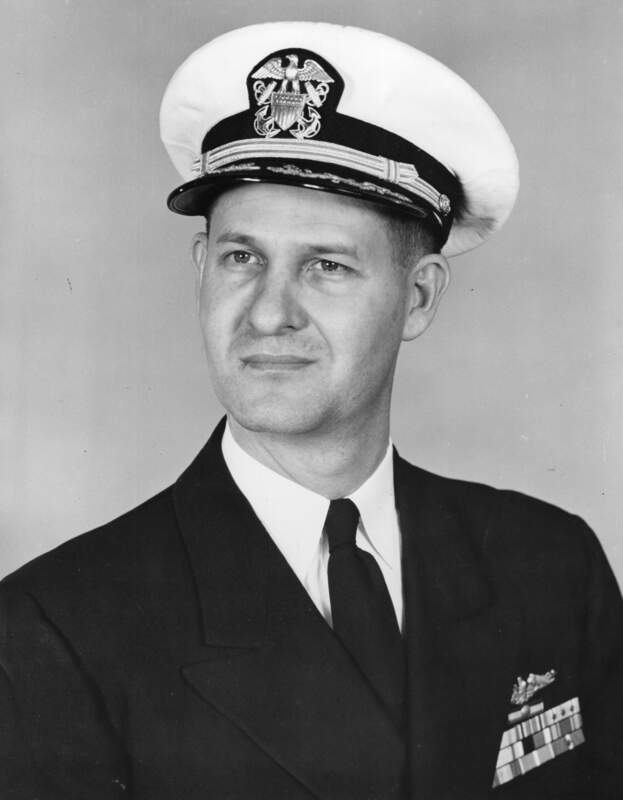 477k CDR R. E. Tuggle, CO Plunger (SSN-595), He took command of the ship from 1 January 1974 to 2 April 1978. Text i.d. courtesy of Wolfgang Hechler. 74k Plunger (SSN-595) entering San Diego, 1985. USN photo courtesy of Bob Shouse. 48k An Oil on Masonite painting by the artist John Charles Roach, entitled "Ballast Point, San Diego", depicts sub base with subs and tenders at the pier in San Diego during mid 1986. The tenders were possibly the: McKee (AS-42) for Subron 7 & Dixon (AS-37) for Subron 3. 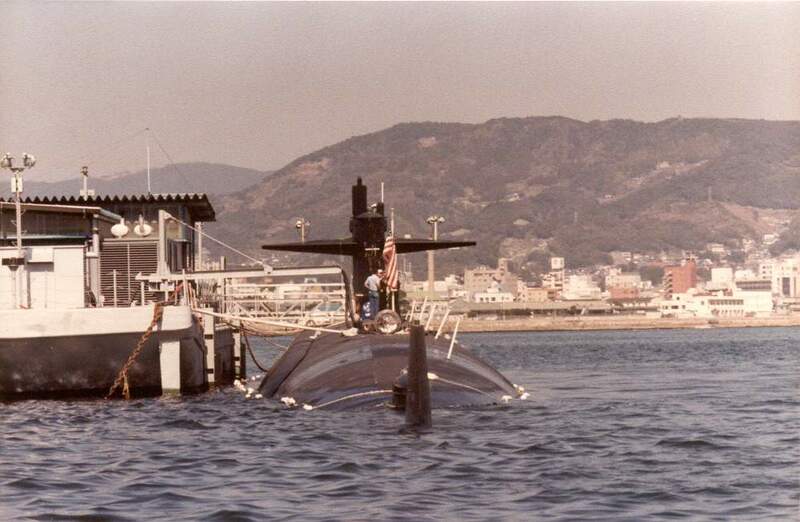 82k Plunger (SSN-595) in Sasebo, 1986. USN photo courtesy of Bob Shouse. 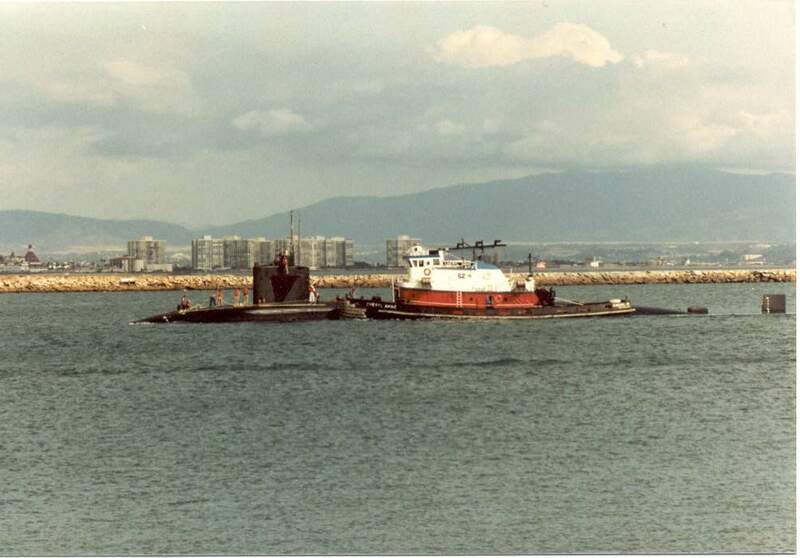 636k Ex-Plunger (SSN-595), awaits towing to Puget Sound for scrapping after inactivation at Mare Island in April 1990. Note: Her sonar dome has been removed and there is an emergency diesel aft of her sail. MINSY # 239208-4-1990 NS, USN photo # 239208, courtesy of Darryl L. Baker. 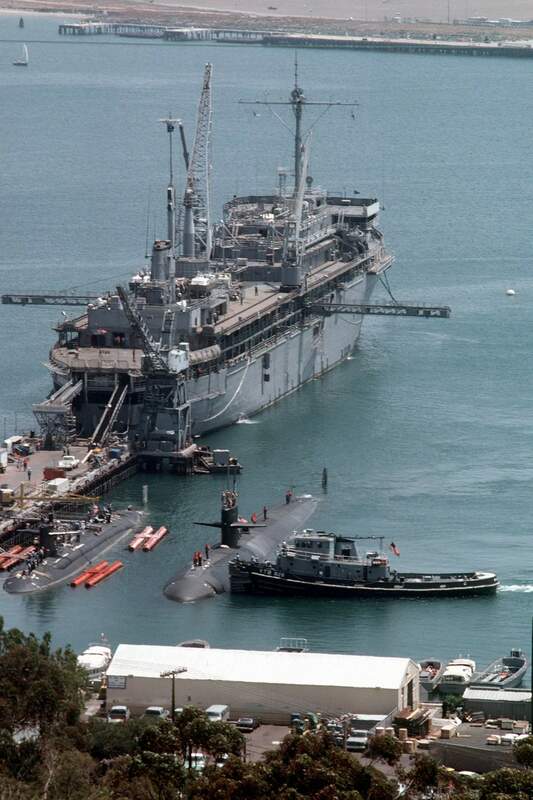 207k Plunger (SSN-595) berthed at Mare Island after her inactivation in May 1990. USN photo from the files of the Vallejo Naval & Historical Museum, courtesy of Darryl L. Baker. 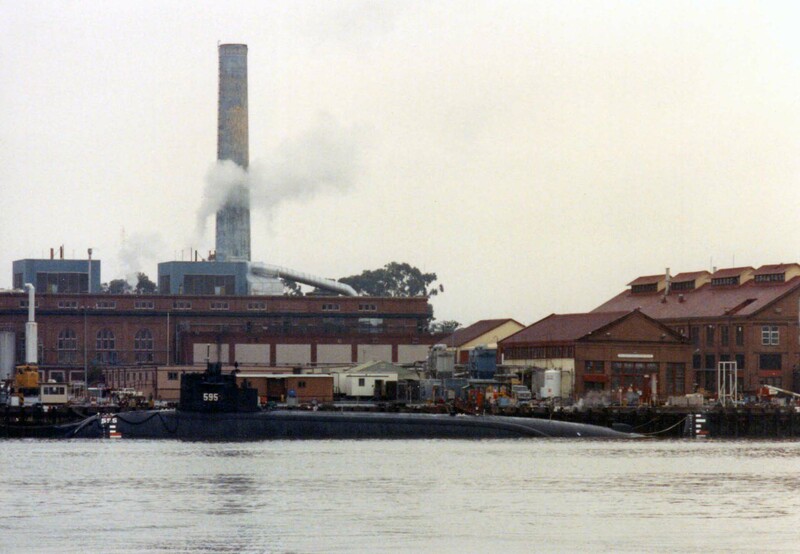 Patrick Henry (SSBN-599). Photograph courtesy of Ray Arntson via btrosper.com.